Scientists at the University of Nottingham have made a significant leap forward in understanding the workings of one of the mysteries of the universe. They have successfully simulated the conditions around black holes using a specially designed water bath. Their findings shed new light on the physics of black holes with the first laboratory evidence of the phenomenon known as the superradiance, achieved using water and a generator to create waves. The research - Rotational superradiant scattering in a vortex flow - has been published in Nature Physics. It was undertaken by a team in the Quantum Gravity Laboratory in the School of Physics and Astronomy. The work was led by Silke Weinfurtner from the School of Mathematical Sciences. In collaboration with an interdisciplinary team she designed and built the black hole 'bath' and measurement system to simulate black hole conditions. 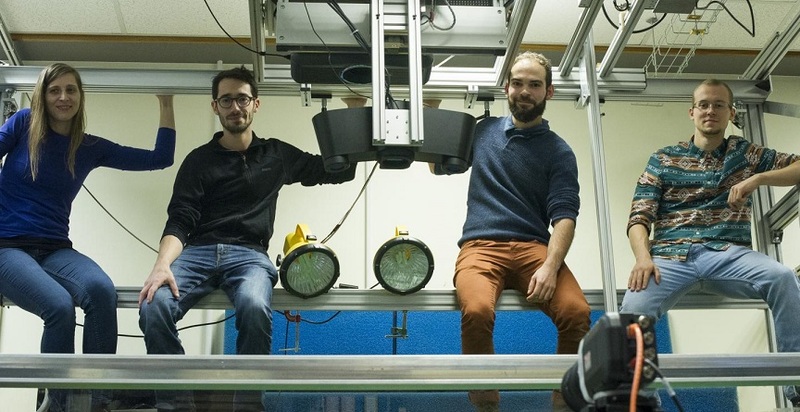 Dr Weinfurtner said: "This research has been particularly exciting to work on as it has bought together the expertise of physicists, engineers and technicians to achieve our common aim of simulating the conditions of a black hole and proving that superadiance exists. We believe our results will motivate further research on the observation of superradiance in astrophysics." The Nottingham experiment was based on the theory that an area immediately outside the event horizon of a rotating black hole - a black hole's gravitational point of no return - will be dragged round by the rotation and any wave that enters this region, but does not stray past the event horizon, should be deflected and come out with more energy than it carried on the way in - an effect known as superradiance. Superadiance - the extraction of energy from a rotating black hole - is also known as the Penrose Mechanism and is a precursor of Hawking Radiation - a quantum version of black-hole superradiance. Dr Weinfurtner said: "Some of the bizzare black hole phenomena are hard, if not, impossible to study directly. This means there are very limited experimental possibilities. So this research is quite an achievement." The 'flume', is specially designed 3m long, 1.5m wide and 50cm deep bath with a hole in the center. Water is pumped in a closed circuit to establish a rotating draining flow. Once at the desired depth waves were generated at varied frequencies until the supperadiant scattering effect is created and recorded using a specially designed 3D air fluid interface sensor. Tiny dots of white paper punched out by a specially adapted sewing machine were used to measure the flow field - the speed of the fluid flow around the analogue black hole. This research has been many years in the making. The initial idea for creating a supperradiant effect with water started with a bucket and bidet. Dr Weinfurtner said: "This research has grown from humble beginnings. I had the initial idea for a water based experiment when I was at the International School for Advanced Studies (SISSA) in Italy and I set up an experiment with a bucket and a bidet. However, when it caused a flood I was quickly found a lab to work in!